It was a fuss free trip, time provided for each location is just enough. Our tour guide Vicky is good. There are maps available for us to download and she is able to help us to book the sky lantern before we reach shifen. As any visitor to Taipei knows, the quaint and historic hillside village of Jiufen is arguably the number one place to visit near Taipei. But it's not the most convenient place to get to - until now! 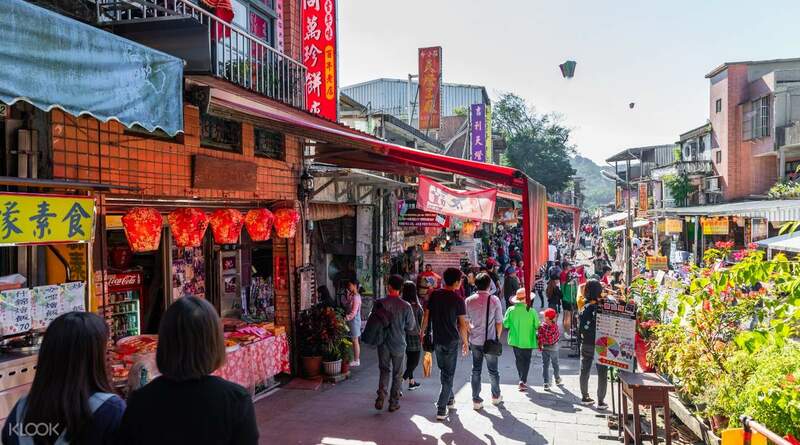 Avoid the slow buses and expensive taxis, and book this extremely convenient return day trip transfer - the Jiufen shuttle bus from Ximen - for a discounted price! Stop off at Shifen along the way to decorate a paper lantern and make a wish as it floats into the sky. 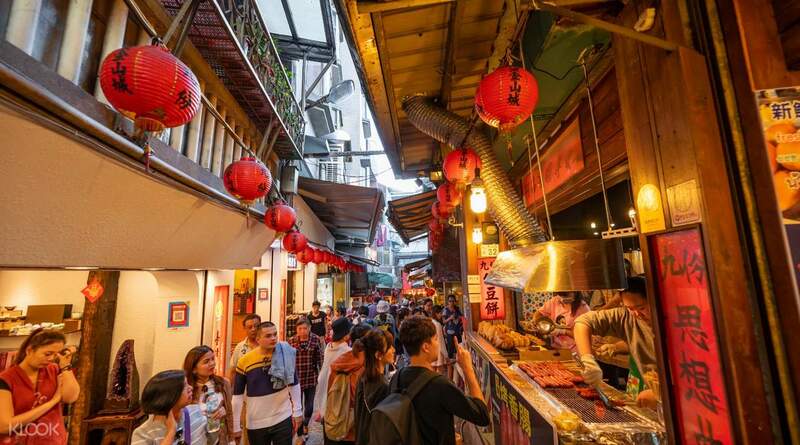 Then stroll the cobbled alleys of Jiufen lined with glowing red lanterns, browse for souvenirs, eat local taro desserts or settle in to a traditional teahouse and take it all in. This isn't a guided tour, so you're free to enjoy Jiufen on your own time. What's more, you'll even get the chance to meet like-minded travelers on the bus journey. It really is the best way to get to Jiufen from Taipei! They provide a very good and friendly tour guide for this trip! Best recommend for this, easy to find the gather pick up point at Ximending! A very experienced tour guide will show you all the place that worth visit in Jiufen and best take picture view at the Shifen Waterfall, he even help us to get the yummy chicken wing at Jiufen for us to let us to have more time to visit at Jiufen :) A very worth trip and happy one! They provide a very good and friendly tour guide for this trip! Best recommend for this, easy to find the gather pick up point at Ximending! A very experienced tour guide will show you all the place that worth visit in Jiufen and best take picture view at the Shifen Waterfall, he even help us to get the yummy chicken wing at Jiufen for us to let us to have more time to visit at Jiufen :) A very worth trip and happy one! Overall, the experience was excellent! Our tour guide Peter was very amiable and knowledgeable about the tour and its content. The bus was very comfortable and has safety precaution. Itinerary was followed thoroughly and Peter has booked us with lots of stuffs in advance like the food, lantern and seat reservation so we had a wonderful and easy trip. Will definitely book in the future. Thanks klook! Overall, the experience was excellent! Our tour guide Peter was very amiable and knowledgeable about the tour and its content. The bus was very comfortable and has safety precaution. Itinerary was followed thoroughly and Peter has booked us with lots of stuffs in advance like the food, lantern and seat reservation so we had a wonderful and easy trip. Will definitely book in the future. Thanks klook! Truly enjoyed this tour, although it is a little bit rushed. But this allows us to see more places. Our tour guy Alex is very informative and humorous. There wasn't any dull moment as he shared history and whatnots. The bus is comfy and spacious. Truly enjoyed this tour, although it is a little bit rushed. But this allows us to see more places. Our tour guy Alex is very informative and humorous. There wasn't any dull moment as he shared history and whatnots. The bus is comfy and spacious. This was my favorite tour so far! Jiufen old city was mesmerizing and breathtaking. Our tour guide Alex was very good, very informative and interactive. He was really lively and even cracks a few jokes when we are in the bus. This was my first tour ever as I normally do DIY travel before as I always think that I am not able to explore much with tours. But this tour changed my mind about it, and I really enjoyed much. Kudos to Alex for being a really awesome tour guide. Keep up the great work. This was my favorite tour so far! Jiufen old city was mesmerizing and breathtaking. Our tour guide Alex was very good, very informative and interactive. He was really lively and even cracks a few jokes when we are in the bus. This was my first tour ever as I normally do DIY travel before as I always think that I am not able to explore much with tours. But this tour changed my mind about it, and I really enjoyed much. Kudos to Alex for being a really awesome tour guide. Keep up the great work. Our tour guide was accommodating and informative. The bus left on time, but due to holiday rush and traffic, we were not able to return to Ximen station on time. Jiufen is a good place to buy souvenirs. They sell different kinds of tea, and spirited away items. The waterfall was also nice. Lantern was okay too, if you are concerned about the trash it may leave, we were informed that the locals do recycle the lanterns, and if I remember it correctly, the government pays them for it. The experience was nice, but it you can, it is best to avoid this tour during a holiday or during the weekend. Our tour guide was accommodating and informative. The bus left on time, but due to holiday rush and traffic, we were not able to return to Ximen station on time. Jiufen is a good place to buy souvenirs. They sell different kinds of tea, and spirited away items. The waterfall was also nice. Lantern was okay too, if you are concerned about the trash it may leave, we were informed that the locals do recycle the lanterns, and if I remember it correctly, the government pays them for it. The experience was nice, but it you can, it is best to avoid this tour during a holiday or during the weekend. great tour. our tour guide Lena was very accommodating and made sure that no one gets left behind. Also, she had explained to us the history of each site. If you are going to juifen or shifen prepare your feet as walking up the stairs can be very tiring. Make sure to wear comfy shoes. But overall the experience with the tour and food is very good. great tour. our tour guide Lena was very accommodating and made sure that no one gets left behind. Also, she had explained to us the history of each site. If you are going to juifen or shifen prepare your feet as walking up the stairs can be very tiring. Make sure to wear comfy shoes. But overall the experience with the tour and food is very good. Everything was on scheduled. It was tiring a activities, needs many climbing in Jiufen and Shifen area so make sure your legs is strong enough. Not recommended for small childrens. Worth the money as the journey to Jiufen & Shifen cost more than you pay on Klook if you go privately. Everything was on scheduled. It was tiring a activities, needs many climbing in Jiufen and Shifen area so make sure your legs is strong enough. Not recommended for small childrens. Worth the money as the journey to Jiufen & Shifen cost more than you pay on Klook if you go privately. 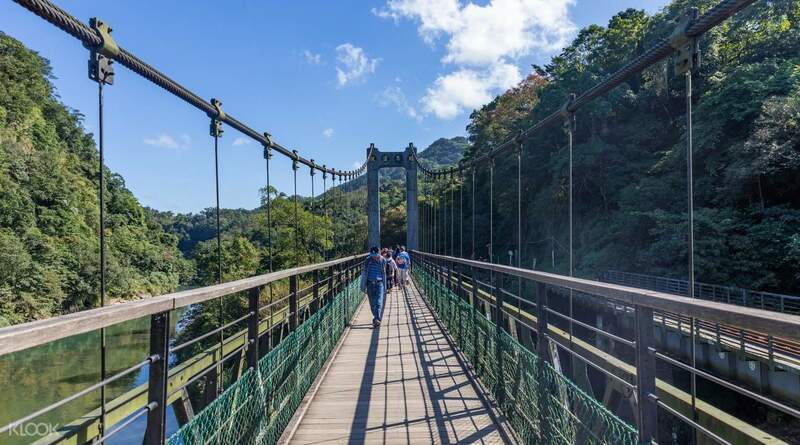 It was a great experience and hassle free..Our tour guide Mae is friendly and knowledgeable.She told us the history of the places.I highly recommend this tour to everyone who wish to visit this 3 places in Taiwan.We really enjoyed the place and the nice cold weather.Overall this tour is very worth it! It was a great experience and hassle free..Our tour guide Mae is friendly and knowledgeable.She told us the history of the places.I highly recommend this tour to everyone who wish to visit this 3 places in Taiwan.We really enjoyed the place and the nice cold weather.Overall this tour is very worth it! Q: Can I come back from Jiufen the next day ? A: This bus only provides a same-day return. If you would like to stay overnight in Jiufen, please make sure that you tell the driver so that the driver and passengers on the bus won’t wait for you unnecessarily. Please note that you won’t get any compensation if you don’t take the return journey. You will have to organize your own transport back the next day when you decide to return. Q: Does a 15 month old baby need to buy a ticket? Q: Do we have time to go to Shifen waterfall and to fly lanterns at Shifen? A: Not quite enough. 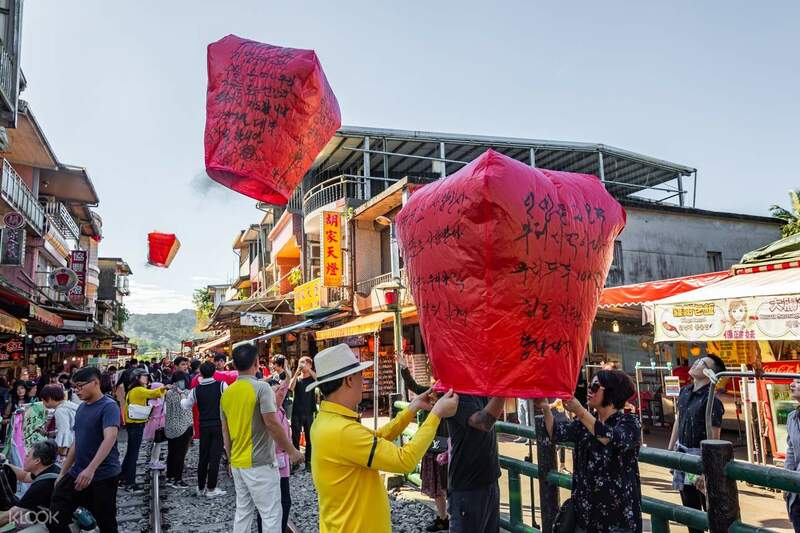 We suggest you just fly the lanterns and walk along Shifen Old Street. 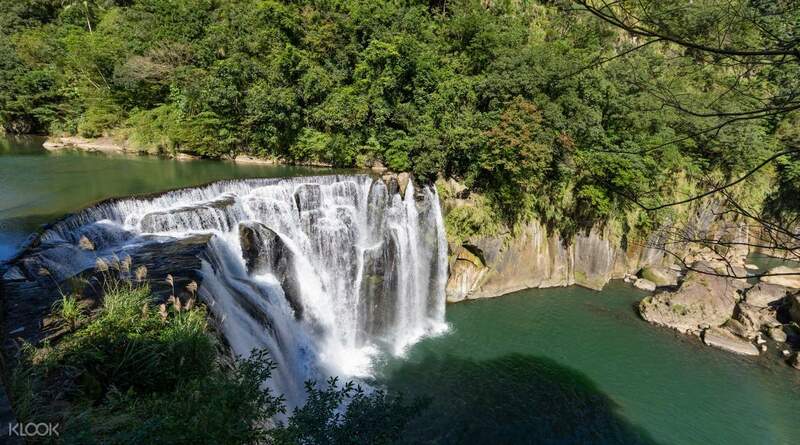 Since it takes about 40 minutes just to walk to and from Shifen Waterfall.